There are two methods of fitting the unit to your camera. The conventional way is to remove the lens from the camera and screw the unit in its place by turning the complete assembly round until it is fully screwed home into the camera front, then release the small knurled screws which allow you to adjust the unit and re-lock square with the camera body. The lens is then screwed onto the front panel of the bellows unit. A better method is to first remove both the front and rear lens flanges by unscrewing the four knurled screws sufficiently to allow these flanges to be lifted up and out. These lockscrews must be unscrewed until their points are completely withdrawn from the large recess in order to clear the tapered edge of each flange. Now select the rear or male mount and screw, or bayonet, into the camera body. Screw, or bayonet the front flange onto the lens, which may then be placed into position on the unit and lightly secured by the two knurled lockscrews. Now the complete bellows unit can be fitted to the camera body by placing the camera onto the back of the unit, making sure that you enter the dovetail of the flange into the top of the recess moving it down into the working position and finally securing square to the camera by tightening the two knurled lockscrews. Do not overtighten these screws as a light pressure will prevent the unit from twisting, and too much force will mark the tapered edge of the flange, so preventing accurate location in time. Be sure to keep the flange dovetails clean and free from grit in order to ensure perfect alignment. The previous description of fitting the B.P.M. 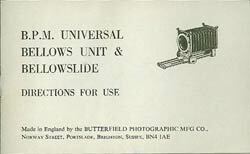 Universal Bellows Unit is correct for ultra close-up photography. With a 50mm camera lens and the maximum extension of 150mm, a magnification of 3x image size can be attained. It must be understood that at these high magnifications the depth of focus is very shallow, and the subject extremely close to the lens. It is easy to obtain unsharp pictures due to camera shake and the unit is provided with two tripod holes in order that this may be overcome. When fitting to a tripod, ensure that you select the hole which is closest to the centre of balance of the unit and camera. One very convenient method of close-up photography is to first decide the area you wish to cover by focussing on a rule. Lock the unit and leave set, now approach the subject until it appears sharp in the viewfinder, then make the exposure. Every bellows extension has a blind spot in its focus range. This is due to the closed thickness of the bellows plus the frame and mount. The B.P.M. Bellows Unit has been specially designed to keep this to a minimum and comlete with screwed flanges its fully closed extension is no greater than 30 mm. With bayonet type flanges this dimension may be slightly greater depending on the type of camera mount. The following three examples will explain. Example No.1 ( (Lens 50mm. + Extension 50mm. ) / Lens 50mm. ) = 10/5 = 2 x 2 = 4x factor. Example No.2 ( (Lens 50mm. + Extenson 100mm. ) / Lens 50mm. ) = 15/5 = 3 x 3 = 9x factor. Example No.3 ( (Lens 50mm. + Extension 150mm. ) / Lens 50mm. ) = 20/5 = 4 x 4 = 16x factor. The extension can be read from the right hand pillar in centimetres. This scale is approximate, and should only be used as a guide. This is due to the slight variations in the lens mounts and relative positions of the nodal points of the lenses which vary in different makes. Most lenses that have a focal length of not less than 75mm or longer than 125mm will make a satisfactory telephoto lens. Longer types may be accommodated by fitting an extension tube on the front of the bellows unit if necessary. This includes a large selection of the older type lenses intended for plate or roll film cameras, with or without focusing mounts. To make a lens of this type focus on infinity when used on the B.P.M. Bellows Unit, it is important that the distance from the rear of the lens mount to the focal plane is greater than the total distance of the camera plus Bellows Unit at its shortest extension. Likewise, a lens that has a focal length that is greater than the total extension provided by the camera and fully extended Bellows Unit, will not focus at all, unless an additional extension tube is fitted as mentioned previously. Lens flanges can be supplied to fit any scre fitted lens. Blank flanges with a plain hole can be supplied for lenses which have a screwed retaining ring, and when ordering this type it is important to state clearly the size of hole required and length of thread. If a screwed flange is required for a non-standard lens, it is insufficient to quote the thread diametre and pitch. Such lenses must be sent to our works in order that the correct fit is maintained. All lenses sent for fitting, will when completed, be returned by post packed in a similar way in which it was received. The cost of return postage should be included in the remittance for flange or mount. Whilst every precaution is taken, the manufacturers cannot accept responsibility for damage or loss of customers lenses in transit. The B.P.M. Bellows Unit is supplied complete with a special frame to enable the user to reproduce colour transparencies, make black and white negatives from colour slides and monochrome slides direct from negatives. Simply clip the frame between the two pillars as in the illustration, and rack the lens to a position that just covers the area of the slide. Avoid placing the frame too far away as this will result in including part of the unwanted mask. Once the approximate lens position is found, it is easier to move the slide frame to obtain final focus. Illuminate from the rear by daylight, photoflood or flash, according to the type of film in the camera, making certain that the camera is not pointing directly at the light source or sun. By far the most satisfactory illumination is achieved if a white card is placed at 45 degrees to the direction of the light to reflect the light on to the rear of the slide. A good lens hood is also desirable to exclude unwanted side reflections. Correct exposure can be ascertained by placing an exposure meter close up to the slide and making a direct reading. To reproduce a 35mm slide the same size, a total extension of twice the focal length of the lens will be required. This means that the meter reading must be multiplied by 4. For example, a direct meter reading of 1/4sec at f/11. The correct exposure would be 1 second at f/11 or 1/4sec at f/5.6.